55030 - 25mm Orange Halloween Sheer Organza Ghost/Pumpkin Ribbon x 20 Metre Rolls!! 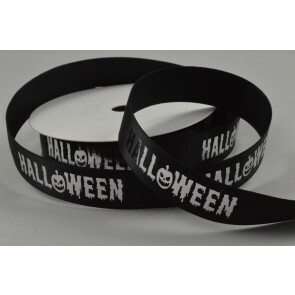 55083 - 15mm Black Halloween Printed Ribbon x 10 Metre Rolls! 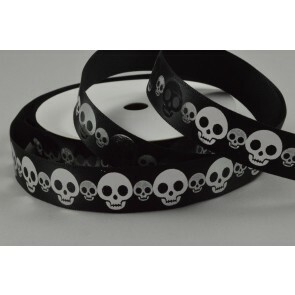 55085 - 15mm Black Skull Printed Ribbon x 10 Metre Rolls! 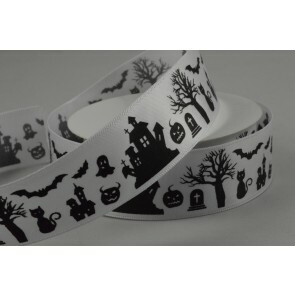 55084 - 25mm White Halloween Printed Satin Ribbon x 10 Metre Rolls! 55031 - 25mm Black Halloween Sheer Organza Ghost/Pumpkin Ribbon x 20 Metre Rolls!! 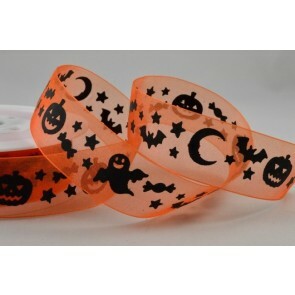 55029 - 25mm "Happy Halloween Trick or Treat" Printed Satin Ribbon x 10 Metre Rolls!! 55027 - 25mm Black Halloween Ghost Boo Pumpkin Printed Satin Ribbon x 10 Metre Rolls!! 55028 - 25mm Orange Halloween Ghost Boo Pumpkin Printed Satin Ribbon x 10 Metre Rolls!! 88135 - Orange Coloured Tinsel x 2 Metre Lengths! 88143 - Orange & Black Halloween Tinsel with Hanging Black Pumpkins x 2 Metre Length! 88135 - Black Plain Coloured Tinsel x 2 Metre Lengths! 15mm Orange Double Sided Satin x 25 Metre Rolls!